Installation of 2 U21 tracks in parallel allows for 2 doors traveling in bypass. U 21 aluminum track for a silent glide. 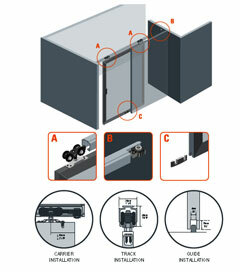 Fascia for U 21 track (accessory) will easily install with a snap providing an elegant finishing. Bracket for U 21 track (accessory) will allow the installation of the track to the wall, avoiding the need of structural modifications in your room.